DBK is my outlet, my release, my sanctuary, and most of all it is my never-ending pursuit of creating the finest scabbards in the world. Many of you are discovering my work for the first time, but a lot of my business is also from repeat customers, which should mean several things to those who haven't done business with me before; you can trust you're going to get what you pay for, and your expectations will be met, or exceeded. Last but not least, you will be treated above and beyond with courteous 'timely' correspondence. They say one never works a day in their life if they love what they do. Call DBK a profession, call it a hobby, whatever it may be it's done with a passion. I've always had, and always will have a strong artistic interest in history. Medieval times is no exception either, and specifically the fascination with the sword. From effigies, medieval art, high adventure, acts of heroism, a display of chivalry, or simply decorative features on a castle wall, the sword has always held a high level of interest for me. My background is a very artistic one, and I grew up learning constructive hobbies, and creative crafts. Later in life I did graphic design professionally for over 15 years. 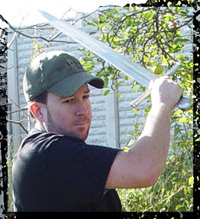 Combining my skills allows me to do what I do with DBK Custom Swords. Putting forth my skills toward a strong interest makes it a very passionate endeavor for me, which means a high quality product for you. Chances are if you're reading this, we share a common bond, and hopefully you will allow me to make you something special with your commission. "The path in my life has led me this far, and I shall continue forth upon this road. I seem to have been guided thus far by something beyond this realm. I have been blessed, for as I look back upon how I got this far I see now how I've been helped along my way by guiding hands, from those I did not see at first, I now know were with me all along." - Brian Kunz, 2017.